Fog covered much of the region on Wednesday. As the skies cleared in the afternoon, bee activity was reported at 5 to 7 hours depending on area reporting. In the north, observers are reporting very deliberate progress in the pace of bud development in many of the region’s orchards. Some have noted that Nonpareil plantings appear to be catching up with their associated California pollenizer and are exhibiting very good overlap between varieties. Many plantings at the start of their bloom are exhibiting a scattering of open flowers along the tops of the trees. As in the central region, some growers have noted that petals are falling from the early-blooming Sonora, even though it has not yet reached its peak bloom. Whether this is a result of the past week’s storms or any other factor remains unknown. However, as a signal of the bloom’s strength, some have reported a very strong aroma emanating from the orchards as the number of open flowers increases. The bloom in the central region continues to progress at a relatively slow pace. Observers have noted that while they expected the bloom to move rapidly through the various stages of development, the pace in the past few days has been much more relaxed. The progression of the bloom has been quite diverse, with a wide variation in the degree of bud development, even from one tree to the next in some plantings. Observers have noted that the advanced examples of the early-blooming Sonora are already beginning to shed petals from the trees even before reaching peak bloom in any individual tree. Many plantings of the Aldrich, Price and Fritz varieties along the Highway 99 corridor are now showing a scattered bloom along the tops of the trees and are leading the Nonpareil into the bloom. The late-blooming Butte is now moving into the early pink tip stage and is followed by the Padre. While a significant proportion of the Padre is well into the green tip stage, a large number of orchards in the central areas of the region are also entirely in the dormant stage. Bud development continues in the southern region in the San Joaquin Valley, providing an increasing amount of open flowers for the bees to forage upon each day. 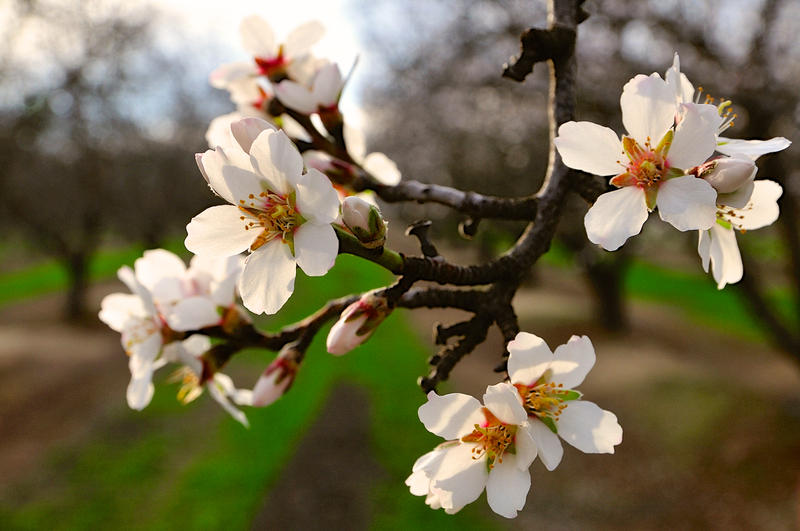 The early blooming Sonora is now well into its bloom and leads the way for all orchards in the region. Observers have noted a small degree of petal loss and the emergence of leaves on the most advanced plantings. The Nonpareil and California type varieties are at nearly equal stages. Considering the other Nonpareil pollenizers, the Monterey is running just ahead of the Carmel, which is now presenting a measurable proportion of its flowers for pollination. Meanwhile, the late-blooming Butte and Padre continue their evolution into the pink tip stage. Observers reported a large number aircraft flying over the region’s orchards as growers step up their disease control efforts. Some have been waiting for their orchards to dry enough to support ground equipment. Weed sprayers, mowers and brush shredders could be found moving through the orchards in plantings that have dried enough to allow access with machinery. Growers continue to monitor the water situation around the state. Legislation has been introduced and the President will be visiting the region on Friday. However, best hopes hinge on more storm systems in the coming weeks to provide additional rain for the orchards and snowpack for the state’s reservoirs. Those with water available from private wells are continuing to provide water for orchards that did not receive adequate rainfall. Growers are also watching weather forecasts as they work to time disease control treatments that may be needed in the event of additional rain. However, should fog continue to cover the region for an extended period of time, growers will be faced with increasing disease pressure even without additional rainfall.